Gloucestershire and Middlesex got the 2017 NatWest Blast got underway in the most thrilling fashion at the Cheltenham Festival, as the match ended on the last ball in a tie. Chasing the hosts 182/5, Middlesex looked doomed at 119/8 in the sixteenth over. But an exciting effort by Middlesex’s 22 year-old all rounder Ryan Higgins who hit an unbeaten 68 from 38 balls, including six sixes, ensured Daniel Vettori’s side shared the spoils. Needing 11 from the last over, the visitors looked to have pulled off the unlikeliest of victories as Nathan Sowter faced the last ball from Benny Howell needing just a single. But all he succeeded in doing was to chip to short-cover, amidst joyous celebrations by the Gloucestershire fielders and misery from the crestfallen Higgins. On a lovely summer afternoon before a sell-out crowd of 5000, Middlesex won the toss and chose to field. 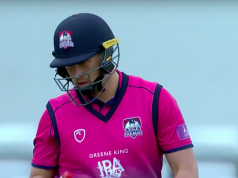 On a typically quick Cheltenham pitch, with short boundaries and a lightning fast outfield that afforded the bowlers little margin for error, Gloucestershire’s 182/5 seemed about par. It was a rather one-paced, with none of the home batters dominating proceedings. That said there were good contributions from Benny Howell (33) and Cameron Bancroft (51), who was due to play in the cancelled Australian A team tour to South Africa next week. Bancroft batted superbly, with one searing cover drive from Southee catching the eye, until he holed out to mid-off to a Toby Roland-Jones full toss just after he reached his half century. 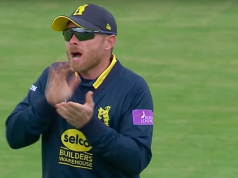 The pick of the seven Middlesex bowlers used were the two least experienced: off- spinner Sowter and seamer Tom Helm, who took a wicket each and conceded around a run a ball. The other five, including international stars Tim Southee and Roland-Jones, tended to bowl too many full- length balls that the home batters were able to drive down the ground. When Middlesex replied, the crowd expected to see the big name top four take the game to the Gloucestershire attack. But it didn’t happen. David Malan (36) looked in good touch. But Brendan McCullum looked rusty. Immediately after muscling a pull of David Payne for a typically belligerent four, he played the most agricultural of hoiks to the same bowler and was bowled. 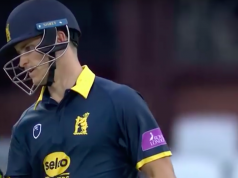 Neither Paul Sterling or Eoin Morgan lasted long and when, Malan was caught on the mid-wicket boundary, Middlesex were 56/4 and looked in trouble. George Scott and John Simpson built a mini recovery, before Simpson was brilliantly run out by Iain Cockbain in the 12th over at 91/5. Scott, Roland-Jones and Southee soon followed before Higgins took charge of proceedings. The Gloucestershire fielding was superb, the feature being a marvellous running catch on the long-off boundary by Cameron Bancroft that competed a good day four the young West Australian. But in the end the winner was the NatWest Blast T20, which clearly has plenty to offer despite all the talk of the upcoming 2020 city-based tournament.